The first thing you've probably already noticed by looking at the picture is that the driver head is gi-normous. The 460CC head -- it doesn't get any bigger -- makes it pretty tough to miss your golf ball. What's more is you don't have to hit it right on the sweet spot because of the technology you may not notice by looking at the picture. The coolest thing is the inverted cone technology with the dual crown. Notice how the shape of the driver head looks like a cone? They've used this modern shape combined with a dual crown -- that is, they've taken a small crown and attached to the top of a bigger, larger, power-base crown. 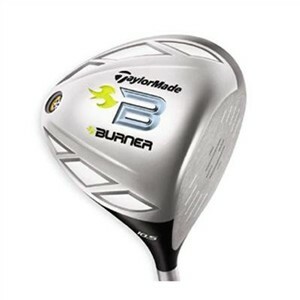 This moves all the weight of the driver back, raising the MOI and lowering the center of gravity. Bottom line is: you can miss hit the ball and the club won't twist like your old driver. That means the ball won't fly as far offline and will go farther on miss hits. The other thing I like about the driver is the shaft. It is very light and easy to swing. You higher handicappers should make sure you stick with the 44" length (with the 11.5-degree loft), which should be the stock shaft. If you are stick (a lower handicapper), go ahead and swing a longer shaft with the lower loft. Finally, before you buy, check out these two new TaylorMade drivers: the TaylorMade Lady R9 Super Tri with an adjustable driver head, and the TaylorMade Lady Burner SuperFast with its extremely light and aerodynamic driver head.